Phnom Penh (VNA) – The Vietnam Fatherland Front (VFF) and the National Council of Solidarity Front for Development of Cambodia (SFDC) held the fifth international conference on building Vietnam-Cambodia border of peace, friendship, cooperation and development for 2017-2020 in Phnom Penh on August 16. In her opening speech, Vice President of the SFDC National Council Men Sam Ol said the two fronts should encourage border localities to establish friendship associations to tighten solidarity and friendship across the fields, particularly in safeguarding border security and order. 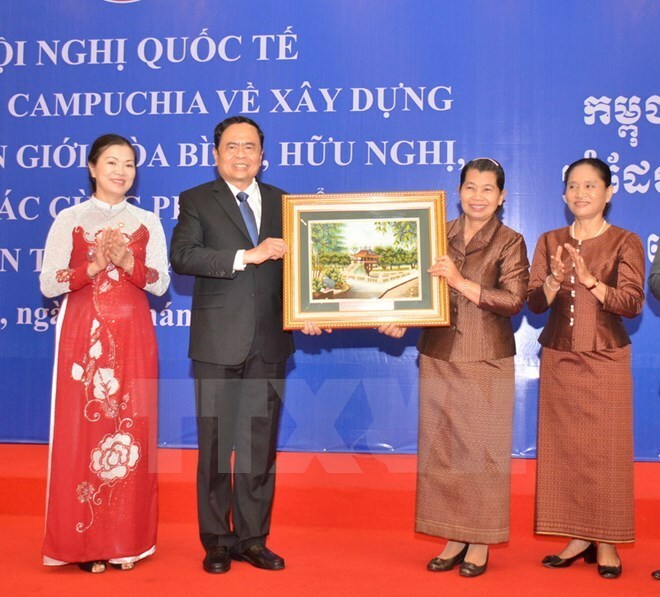 President of the VFF Central Committee Tran Thanh Man hailed the significance of the conference at a time when the two countries celebrate the 50th anniversary of bilateral diplomatic ties. He suggested educating people in the two countries, including young generations, about the tradition of special solidarity, comprehensive cooperation and friendship between the two nations, as well as urging border residents to support the policy on economic development with a focus on promoting tourism under the theme “Two countries, one destination”. The two fronts need to persuade people in border areas to give support to border demarcation efforts as agreed by the two countries’ leaders, he said, adding that he believed the two countries will propel their ties forward despite uncertain developments in the region and the world. The conference reviewed the implementation of the joint communiqué adopted at the fourth conference held in Vietnam in 2014. In their speeches, participants all stressed that solidarity provides the impetus for sustainable bilateral ties. Concluding the event, Vice President of the VFF Central Committee Truong Thi Ngoc Anh and SFDC permanent Vice President and Secretary General Nhem Valy approved a joint communiqué between the two fronts on the outcomes of the conference. Representatives of front organisations in border localities signed an agreement on building a borderline of peace, friendship, cooperation and development for 2017-2020. The next conference is scheduled to take place in Vietnam in 2020. Vietnam and Cambodia share a land borderline of nearly 1,137km, passing through 10 Vietnamese provinces of Kon Tum, Gia Lai, Dak Lak, Dak Nong, Binh Phuoc, Tay Ninh, Long An, Dong Thap, An Giang, Kien Giang and 9 Cambodian provinces of Rattanakiri, Mondulkiri, Kratie, Tbong Khmum, Svay Rieng, Prey Veng, Kandal, Takeo and Kampot. Before the event, VFF Central Committee President Tran Thanh Man held meetings with leaders of the Cambodian Senate, parliament, government and SFDC National Council, during which both sides proposed refining mechanisms to lifting bilateral ties in the future. The delegations of both countries to the conference offered incense to the Vietnam-Cambodia martyrs’ memorial in Kampot province. The VFF delegation also made a working visit to Kampot and presented gifts to local residents living in need.